No matter where you go or what you do, clean water is an essential element for the human being. How do you know that what you're drinking is safe? Ensure your water supply is free of bacteria, viruses and potential disease with Pristine Water Purification Treatment and Systems. Pristine provides peace of mind for the majority of all water sources. 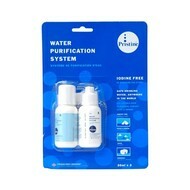 Pristine Personal Water Purification is an affordable, easy way to purify water on the go. You could take a chance that a water source is safe. Or you could know for certain with The Pristine Personal Water Purification System.